Hello friends! 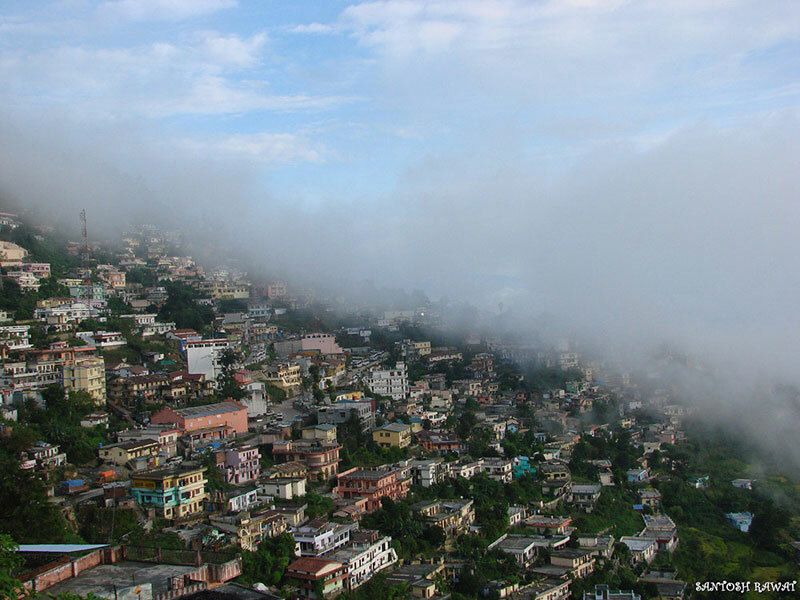 Pauri is a place which is both, religious as well as naturally beautiful and holds equal attraction for everyone. Uttarakhand, the north Indian hill state has so much beauty in it that one can go on and on writing about it and still the description would be incomplete. It is not for nothing that it is called Dev bhumi or "Abode of Gods". 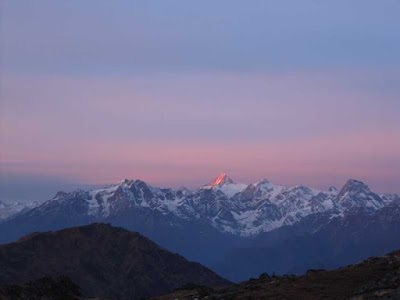 In Uttarakhand, there are religious places and there are beauty spots blessed with stunning natural beauty. One such place is Pauri. Pauri is situated in Garhwal region of Uttarakhand and is a part of Pauri Garhwal district. Situated at an altitude of 1814 m(6500 ft), the place is greatly blessed with natural beauty which includes snow capped Himalayan peaks, dense forests and very beautiful flora and fauna. Pauri is believed to have one of the most beautiful sunsets. The warmth of the local people and their rich culture and traditions make the visit to this place a memorable experience. Catch a plane to Dehradun(133 km/84 mi away) or catch a train to Kotdwar(101 km/63 mi away) and hire a taxi from there to reach Puari, enjoying the most scenic views of nature along the way. 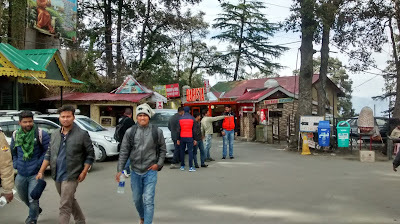 Pauri is very well connected by road network to other major towns of Uttarakhand like Haridwar and Rishikesh. The sub-temperate climate of the region makes it suitable to be visited any time of the year. The summers are generally very comfortable. Rainy season brings with it the greenery all around and the colorful flowers bloom to their fullest. Winters bring with them moderate snowfall which makes the place amazingly attractive. 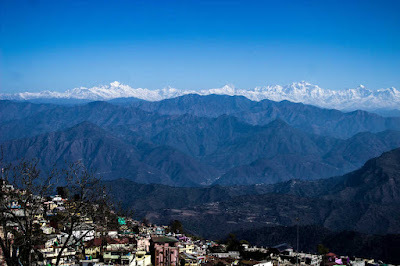 So if you are a snow lover, January and February are the months for you to visit Pauri. The beauty of the placed is enhanced by the fact that it has river Ganga flowing on one side and mighty Himalayas standing tall on the other. You can easily view many top Himalayan peaks from here on a clear day. Peaks like Trishul, Nanda Devi, Hathiparvat, Swargrohini, Kedarnath, Sumeru, Bandarpuunch etc. are clearly visible from here. Due to this, Pauri is a heaven for trekkers. Apart from the peaks, Pauri offers natural streams, gushing rivulets and hills covered with Pine and Oak trees. 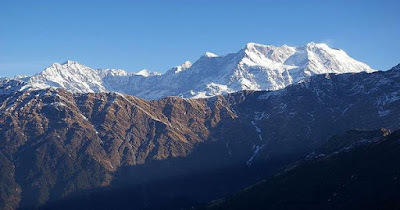 A few popular treks from here are Tara Kund trek, Binsar Mahadev trek and Dudhatoli trek. All these treks provide breathtaking natural views all around. 1. 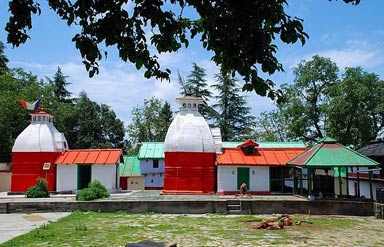 KANDOLIYA TEMPLE - Located 2 km(1.25 mi) away from Pauri bus stand, this temple holds special importance for people here as it is the temple of the presiding deity of Garhwal, named Kandoliya Devta. This holy shrine is surrounded by dense forest in a peaceful ambiance. People throng the temple throughout the year to seek Kandoliya Devta's blessings. Standing in the temple, you get a beautiful view of the picturesque Pauri town and surrounding mountains and snow covered peaks. There is an annual fair in the temple and people come here to volunteer for various activities like cleanliness drive etc. There is a park adjacent to the temple, which is an ideal spot for picnic in peaceful natural surroundings. There are slides for children too. 2. 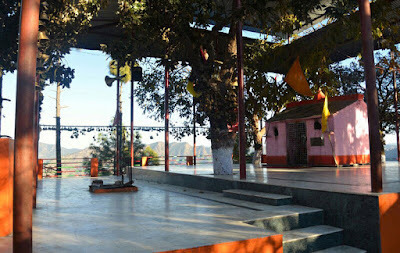 KYUNKALESHWAR MAHADEV TEMPLE - This is a 8th century temple nestled in Alaknanda valley. It is dedicated to Lord Shiva and has an architecture, similar to Kedarnath temple. This temple is believed to have been built by Shankaracharya in 700 A.D. Statues of Lord Shiva, Goddess Parvati, their sons Ganpati and Kartikey, Lord Rama, Sita and Lakshman are situated inside the temple. As much as for it's religious and spiritual value, Kyunkleshwar temple is an attraction due to it's location also. It is situated at an altitude of 1800 m(6000 ft). On one side are the mesmerizing snow capped Himalayan peaks and on the other are the steep rocky treks. 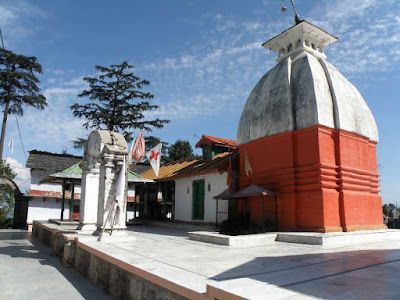 It is again at a distance of 2 km from Pauri bus stand and you will have to take an easy trek to reach the temple. Once you cross the woodlands, you will reach a stairway, which will lead you to the entrance of the Kyunkleshwar temple. Get a panoramic view of the surroundings from here. If you are in Pauri, a visit to Krunkleshwar temple is must since it is the biggest devotional place of the region. 3. 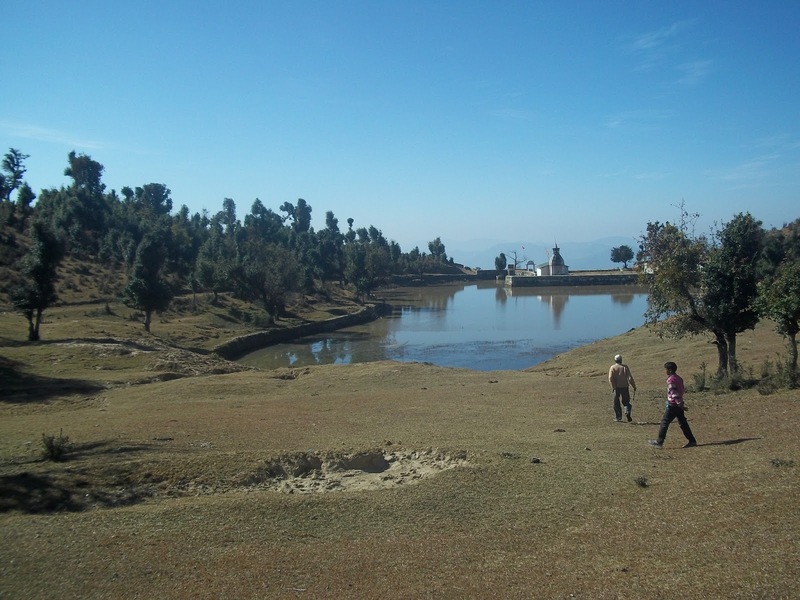 KHIRSU - Located at a distance of 15 km(9.5 mi) from Pauri, this is a quiet village with breathtaking beauty. It is situated at an altitude of 1700 m(5500 ft) and the road from Pauri to Khirsu gives a thrilling experience in trekking. It takes about 50 minutes of trekking from Pauri to reach this picturesque village. Once in Khirsu, you will find yourself among Oak and Deodar trees and Apple orchards, which make this place naturally beautiful. It is home to many species of birds. Imagine standing in the midst of tall trees and Apple orchards and listening to the constant chirping of birds. Khirsu gives you view of major portions of Himalayas and you can see many unseen peaks from here. You can indulge in bird watching, village tourism or nature walks in Khirsu and surrounding villages as well as enjoy the quiet time. 4. 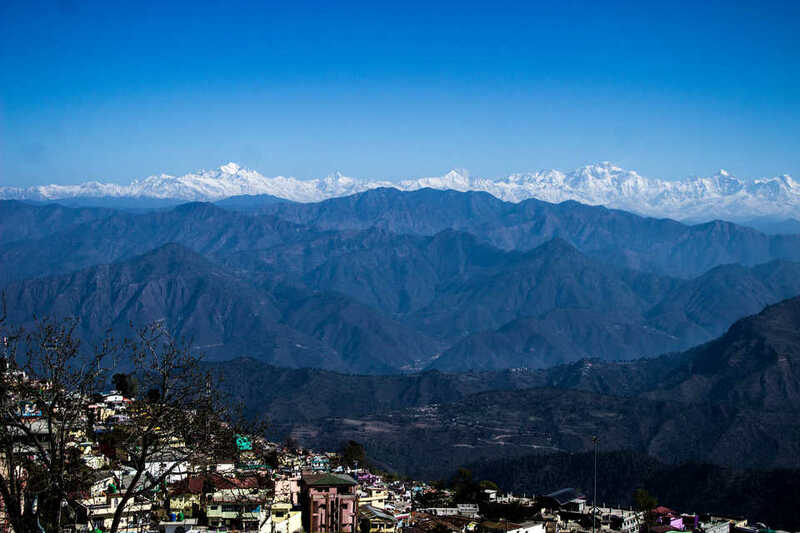 CHAUKHMBA VIEW POINT - Located 4 km(2.5 mi) from Pauri is this vantage point which will provide you with the most alluring view of the Himalayas. It is an ideal spot for photography and nature watching. The spot is surrounded by thick Oak and rhododendron forests. You can get a clear view of spellbinding Himalayan glaciers from here. This is the most picture perfect spot in and around Pauri. The beautiful landscape and the variety of flora and fauna found here are a major source of attraction. Strolling through the area you will reach a pond, whose water is much cooler and sweeter then any cold drinks. 5. TARA KUND - Imagine a lake at 2200 m(7300 ft) above the sea level, surrounded by lush green trees and wildflowers and lying in the lap of Himalayas. 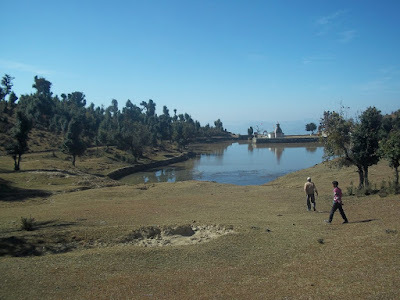 Tara Kund is situated in Chariseh Development Area of Pauri Garhwal. It is about 49 km(30 mi) from Pauri out of which 44 km is motorable and you can drive down to Padani. From here, you have to trek for 5 km(3.2 mi). 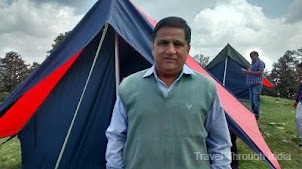 The trek itself is a memorable experience as the surroundings are amazing and it will give you a chance to connect with nature. The lake will mesmerize you with it's ravishing beauty. Located in mystic environs, the place gives a glimpse of rare snow clad Himalayan peaks. 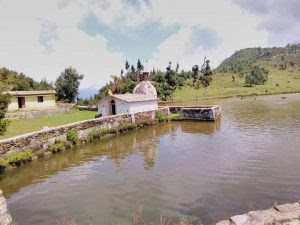 There is an ancient temple in the vicinity of the lake and scores of local people come here during teej festival to offer prayers. There is a fresh water pool also nearby to quench your thirst. Overall, the scenic grandeur of the place will definitely leave you spellbound. There are all kinds of accommodations available in Pauri. You can opt for hotels, resort, tents or home stays as per your choice and budget. So do not wait. The great Himalyan peaks beckon you. Just go and enjoy the nature in most peaceful and beautiful natural environment. Great post! The village of Khirsu sounds amazing. I hope to visit someday. Thanks for liking. Pauri indeed is a great place in the lap of nature. Nice post. This place seems interesting. Your blog is quite informative. Keep sharing more posts like this. Thanks Abhinav. I invite you to subscribe to my blog to keep getting updates on my posts.